The day before was to be considered an epic misery. For the end of March to have solid rain for 12 hours, mixed with ice and snow all carried with a strong northerly wind, misery hardly does the day justice. All through this day, quick glances at the weather forecast showed that better days lie ahead. However, this was also something everyone had been telling themselves for the past month. Just one more miserably cold day. One more snow. The clouds will eventually lift. And, yes, all will be able to wear only one piece of clothing on their backs instead of being layered and insulated as if on an arctic expedition. The sun did come and low and behold the temperature rose above freezing. At the same time, though, the wind came down from the north, still bone chilling cold, reminding all that perhaps this winter has not yet given up. On the other hand, the weather gurus got it right enough to dictate a little air therapy. And today’s mission was a simple one. Big Red and The Captain were to fly a newly licensed pilot to a little grass roots aviation strip not 15 miles away from home base. 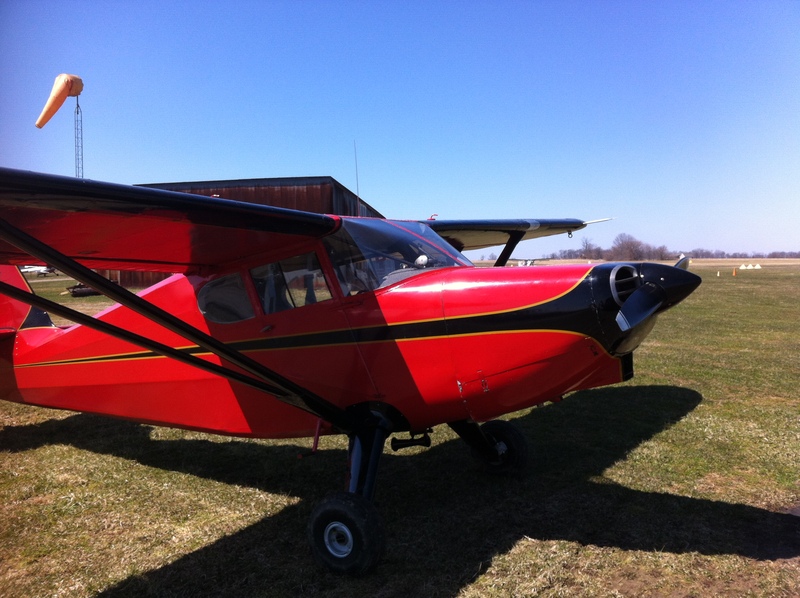 This new aviator is working on a tail wheel endorsement in a small “putt-putt” sixty-five horse Champ. Call it an official Big Red Airlines mission for hire, at least that’s what the Captain was thinking. So Captain arrived early, pulled the old girl from the hangar to let the sun beam down on the cowling and offer some warmth on the chilled cylinders. Radios set and camera bags stored. Check. The Passenger arrives in a tiny little blue sports car. He wears his aviator leather jacket well and the Adelaide Biplanes hat high on his head. As The Captain and passenger jump into the cockpit, the Captain notes the swinging wind sock. 08 or 26? Winds were not strong, but fickle, just like this day. Sunny, yet still chilly. Spring, yet not. The trusty old Stinson fights the cold and sputters to life. She idles a bit rough, but very quickly smooths out and the RPM’s climb and settle at 1,000. Intercoms on, radios are set, taxi commences and a Cessna on the roll out confirms it will be a 26 departure. There is a fair amount of life on this Sunday down at the little airfield. More than one pilot has come down to dust the cobwebs from their planes and their skills, all hoping that the sun that is shining will live up to its promise and warm the day into something a bit more tolerable for March. The Captain takes his plane and passenger to the run up area and goes through the final pre-flight checks. RPM run up – 1800. Check. Mags. Check. Carb Heat. Check. Suction. Check. Oil Pressure and Temperature. Check. Power back. Controls free and correct. Check. Flaps set. Seat belts fastened, and doors latched. Check and Check. Time to go. Onto the runway, the Captain lines up down the center line and advances the throttle at a slow even pace until the old Franklin is at full roar. She sprints forward, and the tail pops free. Flying down the runway, speed builds, at sixty just a bit of back pressure on the yoke is all it takes for the Captain to lift the old girl from the bonds of earth. The wheels shudder as they continue to roll on now weightless, and the Stinson climbs swiftly. The Captain takes the plane to a thousand feet, then banks her into a climbing turn until he reaches a bearing to the east. The houses and the people all fade into miniatures – toys really. The air isn’t too stable, despite the severe clear, and visibility is still limited with a white glaze near the horizon. The prior days cold front still looms and leaves these tiny clues of its passing. Another ten hours and the northern wind will have cleared the air more, offering better visibilities and maybe a change in wind direction that would bring in more warmth. The flight is short, so altitude is kept at 2500 feet. The Captain rides the turbulence, getting into a cadence, nearly anticipating the invisible gusts carrying the little plane up and down, left or right. They start their descent over the little town to the north of the grass airstrip. This strip is frequented by airplanes without electric or radios, so eyes are alert to the pattern, searching for activity and traffic. The Stinson enters into an Upwind leg, still checking for traffic and airport conditions. The Captain knows that the rain the day before has saturated the grass runway, but from 800 feet above the ground, its nearly impossible to discern exactly where the mud obstacles lie within the dead grass runway. They turn crosswind and into Downwind. A Husky turns in front of them, carrying large tundra tires. He announced himself on the radio, but had miscalled his position. The Captain silently swore at this intruding pilot. The Husky had the right away, so the Captain can do nothing but adapt, slowing quickly and holding his altitude a little longer to give the Husky clearance to turn to Base and Final well ahead of the Captain and his Stinson. The Husky kept his pattern tight and was down on Final just as the Stinson turned to Base Leg. The approach was right on the money, and the Captain came onto final and was in a good alignment with the grass runway. Trees lay in the line of flight, but just as they cleared them, the Captain slipped the Stinson and dropped altitude quickly. Three point landings were the key now on this unpredictable runway. 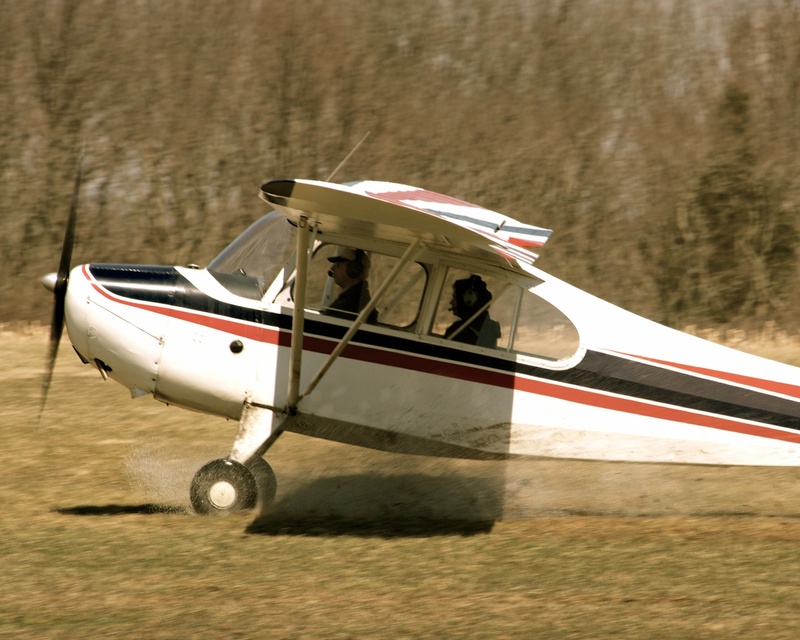 Mud or puddles obscured in the grass could easily mean letting the plane nose over with a quick deceleration of speed, and the best way to avoid that was getting all three tires on the runway at the same time. The Captain didn’t make his best, but certainly not his worst three point landing. Speed bled off quickly and mud started slinging onto the underside of the wing and struts. A few globs of mud made their way to the windscreen. The Captain held power on the taxi, forcing the airplane through the soft turf. They taxied down past some rusty hangars and turned to an area out of the path of other aircraft. It was only then that the pilot realized he had taxied into probably the softest earth on the airfield. 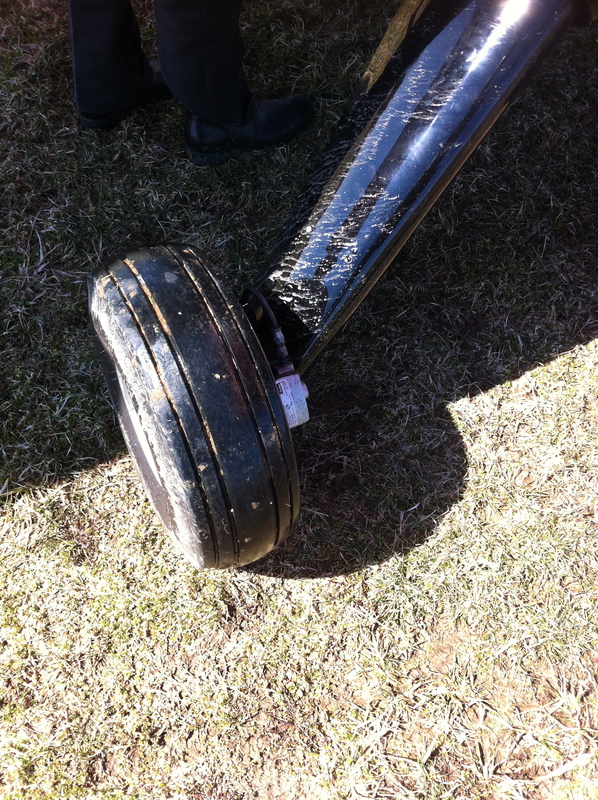 The front wheels dug in and quickly sank eight inches into the turf. They weren’t going anywhere under power, safer to get out and push. The Captain shut down the airplane and he and his passenger walked around and evaluated their predicament. They attempted to turn the airplane and start rocking it back and forth to get free, but that only made the hole deeper. Now they were truly stuck in the mud. With that, the Captain enlisted the help of three others at the airfield. 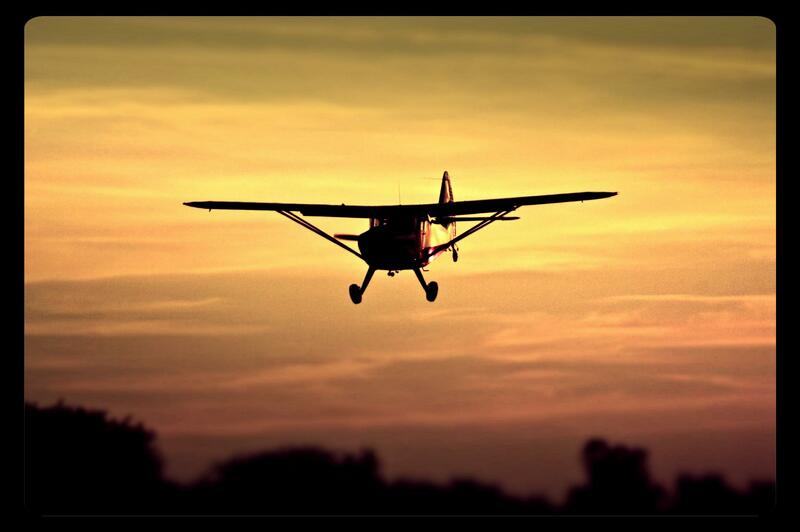 Aviators have an unspoken bond and a silent vow to always come to another aviators aid. So they put their muscle into lifting the plane one wheel at a time from its hole. Then pushing the plane down the gentle decline and back onto more packed soil. Tires covered in mud, and the Captains ego a bit tarnished, he shrugged and pulled out a book to read. For now, his mission was accomplished. As for his passenger, though, the adventure was only just starting. 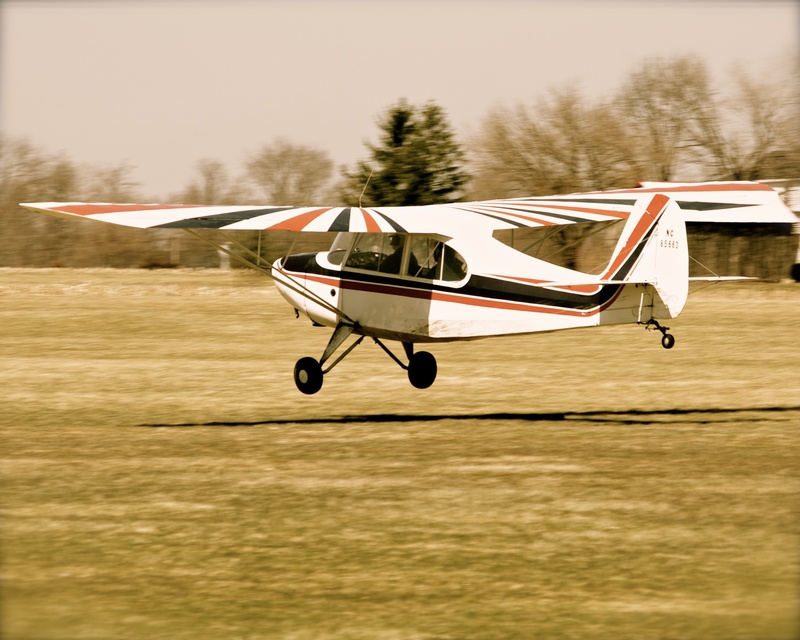 It was time for the newly licensed eager pilot to get into a little Champ and try his own hand at landing in the soft wet grass. Before that happened, there was a period of waiting. Something the Captain could remember only too well. Waiting on the instructor to return from another flight lesson or show up for work. Wondering what kind of mood they would be in. Anticipation. Pacing. Nerves. The Captain was rather glad to have a book to read. He could sympathize with the student and new pilot, but also glad to not have that worry. Well, that wasn’t entirely true. His mind was thinking through their eventual departure and the conditions of the airfield. Listening to the others in the FBO office talk about the conditions of the runway only made his concerns grow. 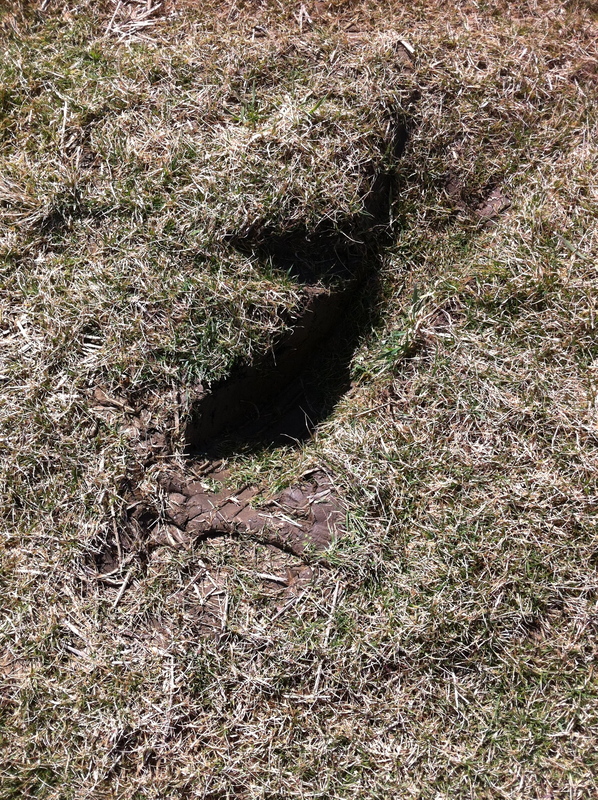 Yes, that field was soft and the runway wasn’t in the best of the conditions after this long harsh winter. There would be many unseen mud puddles and depressions that could allow a tire to bite in at the least opportune time. So he did what so many other veteran pilots did, he put it from his mind and continued reading his book. Not too long later, the new pilots instructor turned up and they had a quick briefing on their flight for the day. Conditions of the airport were a prime point of discussion. They talked about all the things the Captain was silently ignoring. However they made their go / no-go decision and go it was. Off they went to preflight their Champ. The Captain took this time to walk back to his Stinson and walk the grass a bit more, feeling the spongy turf and looking for other areas that he could possibly get bogged in when they would leave a bit later. Then he grabbed his camera and decided to take a few photos of the student and instructor, seeing through the lens better the conditions of the runway as the Champ started its departure roll. Mud and water sprayed forth, but the lightweight champ didn’t seem to miss a beat and quickly leapt from the runway. Well, perhaps “quick” is the wrong word. The Champ lumbered off the grass and clung to the air. But it flew and the take off looked coordinated and controlled. The Captain applauded the student for a job well done. Minutes laters, the Champ was turning to Final for its first landing. To the casual observer, the plane was lined up perfectly with speed and descent rate all correct. The Captain was again impressed and glad to see that this new pilot was quickly learning the best ways to fly an airplane – by the seat of your pants. The Champ settled onto the runway, mains touching down just a fraction of a second before the tail, but a good landing all the same. They taxied back around and off they went, another good take off, this time somehow avoiding the deep mod slinging puddle from the first departure. They came around again and again. The Captain was happy to sit on the ground and observer, as long as he had something to shield him from the cool northern wind. And when he grew too cold, he’d huddle himself back in the Stinson with his book, still able to watch the progress of the lesson. 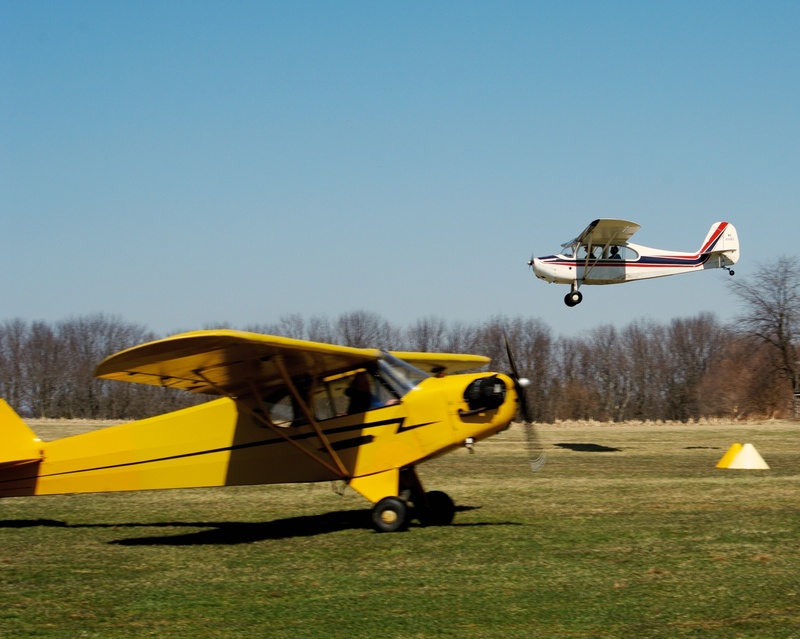 It was not long before the Champ was joined in the air by a Piper Cub, another student learning to fly. The day was shaping up nicely with aircraft taking to the skies. Despite the cold and the mud, these aviators were eager to get into the air. The Captain, observing the gathering of airplanes and people, was not alone for too long. His plane drew attention and it wasn’t long before some were coming by to ask questions and compliment him on the gorgeous red plane. Like a father with his honor student, the Captain boasted about his plane, proud to be its care taker. When the lesson concluded, the Captain went into the FBO following his passenger and instructor. There he could warm up a bit more just briefly and listen in to any comments that might be important insights about the runway conditions. Though he heard nothing from their debriefing of new importance, he was confident that he had observed enough in knowing to stay to the high side of the runway and avoid the center as much as possible. So the Captain and his passenger walked back to the red Stinson and stowed their gear in the rear seat. Repeating the same checks as before, the old girl jumped to life on the second blade. Advancing the throttle smoothly, the red Stinson started rolling forward and gained enough momentum to ease the Captain’s concerns of getting bogged down. They circled up into the run up area and the Captain was careful not to use breaking during the run-up, treating the entire preflight checks as if he were operating on water. They circled back around and cleared the area for traffic, then pointed the plane down the grass runway and advanced the throttle. The Captain pushed the tail from the ground to get her up on two wheels early. Just at that point, though, he hit the first unseen muddy patch and the nose dipped alarmingly. With deft skill, he pulled back smoothly on the yoke and corrected the angle, now trying to get the plane off the grassy field early. The stall warning horn chirped as the wheels lifted from the grass. The Captain eased over the nose just a fraction and let the plane sit in ground effect just a foot over the runway until sufficient speed was there to initiate the climb. 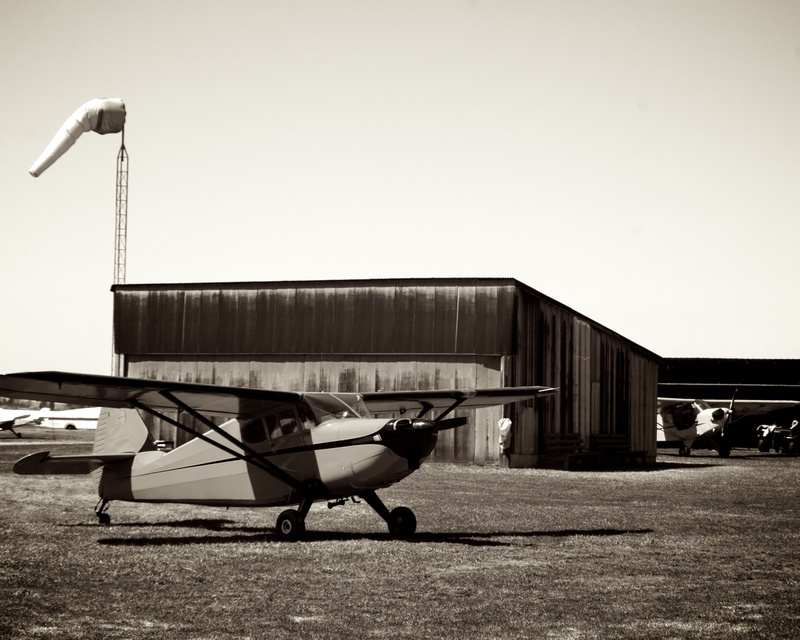 It wasn’t the best take off, but the Captain was unfazed and the old Stinson climbed swiftly into the blue skies. Back at 2500 feet, they flew quietly back towards home. The air still carried a bit of chop, and the winds aloft were strong out of the north, which diminished their ground speed upon descent back into their home base airport. But the flight was short and peaceful. The Captain lined up for a nice three point landing back on the tarmac of their home airport. Though landing on grass is often a more pleasurable experience, it wasn’t something the Captain looked forward to in soft wet conditions. With the Stinson back in her hangar, the Captain looked at the old girl and shook his head. She was covered in muddy spots under the wings, down the struts, and on the main gear. A smattering of dried mud dotted down the fuselage and the windscreen. When the weather got a bit warmer and the wind started blowing from the south, he’d be out at the airfield and giving the old girl a much needed bath. It was a true shame to leave her in this condition. On the other hand, the old girl seemed to be smiling at him. She was wearing the mud as a badge of respect. Big Red had a heart for adventure or misadventure. Either way, she was an airplane that would get you where you wanted to go, and have the nerve, confidence, and strength to get you back. “Nicely done Old Girl,” The Captain said as he turned out the lights and walked out the hanger door. Until the next adventure.